Recently, I posted an LA Times article to my Facebook page about parents who, due to safety concerns, will likely decline the Swine/H1N1 Flu vaccine for themselves and their children. When my Facebook friends posted their reactions to this article, safety concerns were ignored in favor of a slew of responses about striving for herd immunity. It seemed they had already done a risk-benefit calculation, reasoning if some were hurt by the vaccine, herd immunity was more important. (See bottom of article for a back-of-the-envelope analysis of risk-benefit.) What they didn't realize in their arguments is that herd immunity is a moot point when it comes to the flu and flu vaccine. Herd immunity is presumed to occur when 80-90% of a population has a theoretically protective level of antibodies, either from mounting an antibody response to an antigen in a vaccine or from suffering through a virus and recovering. Only 30-40% of people get the Seasonal Flu vaccine - far short of herd immunity. Seasonal flu mutates and changes every year, so there are not years and years of vaccinating people against the same disease to ratchet coverage up to the 80-90% level. Due to mutations, a seasonal (or swine flu) shot that is developed in advance of flu season may not match the circulating flu viruses. In at least half of the flu seasons, there is no virus-vaccine match, leaving 0% of the population with theoretically protective levels of antibodies. The Cochrane Collaboration, an independent evidence-based medical review group, reviewed ALL flu shot studies - decades worth of data - and found that if you get the virus for which you were vaccinated, you will be sick only 0.16 of a day less (4 hours) than if you didn't get the shot. I.e. the flu shot does not work. Tom Jefferson MD, the independent reviewer analyzing all flu shot studies found this in 2006, upon completion of his team's review: "Only among people who suffer bronchitis could he find good evidence that flu vaccination was worthwhile. In infants up to two, vaccination was no better than placebo and in older children there was little evidence of benefit. Nor could he find enough evidence of benefit among people with chronic chest problems, asthma and cystic fibrosis. In healthy adults the best evidence was that, on average, flu vaccination of a population would prevent 0.1 per cent of a working day lost. Combined studies of the elderly showed a variation from no effect to a 60 per cent difference when "all cause mortality" was measured." Even at-risk groups - children, asthmatics, elderly - are not protected by the vaccine. All the studies in these sub-groups show there is no reduction in hospitalizations or deaths among those who were vaccinated for Seasonal Flu. Shedding and spreading: Nasal spray vaccine is an alternative to the injection. However for every 100 children vaccinated this way, 2 - 3 new people will be infected via the children shedding virus from the vaccine.The Seasonal Flu Nasal Spray vaccine is based on a live virus: Adults will also shed virus and be contagious for the flu. This works against herd immunity. Placebo Effect: If you are so worried about a flu virus and still believe the Seasonal Flu Vaccine offers protection, then get vaccinated and you can believe you are protected from those who don't get the vaccine. That's called the placebo effect. Enjoy it. Vitamin D: Normalizing your blood levels of Vitamin D strongly protects against ALL VIRUSES. Check your levels of Vitamin D twice a year: when daylight savings begins and ends. It's cheaper, easier, and safer to avoid all viral illness by maintaining a normal blood level of Vitamin D. At least half of us are deficient, which is the main cause of "Flu Seasons" in the winter. If you do get a virus, you can treat it with high doses of Vitamin D for seven days after onset of symptoms. My friend K.A. tried this last week when she came down with a bad flu and she wrote, "It really worked...I took just 4 [16,000IU of D3] and it worked... it was miraculous....I was on the mend and so surprised!" See the Vitamin D Council for instructions. Always consult your doctor. Thanks Monkey Girl! I was wondering when someone was going to comment on this flu shot series I did this week. One of the most concise and informative articles I've read on this subject. You should really try to get this published more broadly. It is deserving of a wide readership. Congratulations on a job well done and THANK YOU. Thank you Hamm. (I'm guessing that is not you real name!) I appreciate it. Where would you like to see this published? I can work on it. In the meantime, forward to anyone you think would like to read the facts on flu vaccine. Thanks! And there you have it folks, why and my kids are not getting flu shots anymore, especially the swine flu vaccine. Thanks Alix! You're the research Queen! BTW, when I think of "herd" I think of sheep. And don't sheep just follow each other over the cliff? That's ME and my kids. Sorry for the typo. Kim, I was indeed pleased that the first herd photo in my search was of sheep! It was just so perfect. 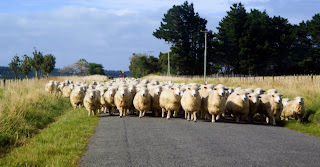 Mike Adams of Natural News refers to the herd mentality syndrome by just calling people "sheeple." I think people are smarter than that, but so many don't have the facts. If they did, they would make totally different decisions. Sorry - I just posted a comment and then realized it had a typo that made it not make sense. Great to hear from you and thanks for posting your real life experience with the flu shot. I had two winters in a row where I was very D deficient and got the flu really badly both times. I didn't realize that was the connection until a couple years ago when all the new info on Vitamin D started to come out. I literally had to get IV fluids in the ER two years in a row! Since normalizing my D, I have had one illness that was flu-like and which kept me down for quite a few days, but I was not barfing or anything. Seemed like a new strain since my entire family got it really badly (just really tired and sick feeling, no barfing). It was last spring so I wonder if it was swine flu before we knew about the disease? Hi Alix, I found your blog! Nice meeting and chatting with you today at the farmers market. Here I am going on and on about my life-crisis story to you - and, wow, look at you and your blog! You've really grabbed the torch and are lighting the way, I can see. I'd like to thank you in advance for all your diligent and hard work and getting this good info out there for people to see. Maybe see you next week at RawDaddy :-) Cheers! I like your blog and the "herd mentality" made me laugh. You're post is so accurate. Nice to meet a fellow lyme disease/chronic illness researcher :). Thanks for stopping by, Athena. Glad you like my blog and happy to know another Lyme buddy. I agree. I just read a summary of rules for healthy eating that Michael Pollan requested from readers. One that stood out was: "better to pay the grocer than the doctor." Love that. Couldn't agree more. Let me also say that I am unclear, especially on your blog re: flu vaccines don't work, whether it is your voice behind the evidence, or Dr. Tenpenny's. I welcome all civilized comments. I grant that such discussion will not change anyone's mind who feels vaccines are always a bad idea, but I am trying to get info out there--both pro and con--for folks genuinely trying to make sense of H1N1 right now. I hope that you take my comments in that light--I genuinely mean no disrespect, and again, I am very appreciative that you back up what you say with references, in contrast to most of those discussing H1N1, whether for or against the vaccine. I'm crafting a post to respond to your comment. For now, know that my math is not incorrect. According to the 60 Minutes episode about the 1976 Swine Flu Vaccine Fiasco with Mike Wallace (where I assume they employ good fact-checkers), there were 4,000 swine flu vaccine injury claims, 300 of which were for death. 40 Million were vaccinated in 1976, so the injury/death rate was actually 0.01%. I do need to notate that in my calculations in the post and will revise that soon. Also remember that vaccine injury claims are notoriously under-reported so even if they were not all paid out, the number of serious injuries was likely (much) higher than 4,000. I can only assume those initial figures were revised down to reflect the number of claims paid which gets us to what I consider an artificially low injury rate of 1 in 100,000. It is irrelevant to me in my calculations if people recover from GBS or not. Don't get me wrong, I'm glad that most regain function after paralysis, but they have suffered severe immune damage that I'd imagine plagues their overall health for the rest of their lives. As for citing Sherri Tenpenny's data. She did what you did with the single Vitamin D study. I thought her stats were evocative and I guess you found them to be so as well. I tend to prefer meta-analyses, as opposed to single studies, to help me make my decisions. I did mention the Cochrane Collaboration meta-analyses of ALL flu shot studies. The main author of the reviews penned an editorial in the BMJ asking why flu shot policy (wide promotion) does not match the poor efficacy. As for Vitamin D's effects on health there was a great review study in the New England Journal of Medicine by Dr. Holick - Vitamin D Deficiency. Dr. John Cannell also maitains the site www.vitamindcouncil.org which contains a vast amount of information on normalizing Vitamin D blood levels for optimal immune function. I just looked at the single Vitamin D study you cited and the case-control groups both had extremely low 25-hydroxyvitamin D (64 and 63 nm/l = 25 ng/ml). The level of supplementation for the study group was quite low - not even considered a maintenance dose - though it did raise the levels in the study group to just above the low level (88.5nm/l = 35.5ng/ml). Optimal blood levels start at 50ng/ml so this study fell quite short. It is not surprising at all that the results didn't show a protective effect with blood levels going from low to just above deficiency range. Since more than half the population is D deficient, the effects of D are drastic when you take someone from below 30 ng/ml into the ideal or high normal range. That is what all the excitement about D centers around, not the study you cited which didn't supplement with enough D to achieve a significant increase.